The last two winners of the $500,000 Ladbrokes Oakleigh Plate (1100m), Sheidel and Flamberge, are among the 2018 nominations for the Saturday’s Group 1 sprint at Caulfield. Flamberge stormed home to nose out Fell Swoop in winning the 2016 Oakleigh Plate when trained by Peter Moody while the Lindsay Park Team of David and Ben Hayes and Tom Dabernig saddled up the speedy Sheidel for an all the way win last year. Flamberge hasn’t won a race since from ten starts but is now under the care of Mathew Ellerton and Simon Zahra and has started to regain some form with a last start second to Super Cash in the Group 2 $200,000 Rubiton Stakes (1100m) at Caulfield on February 10. 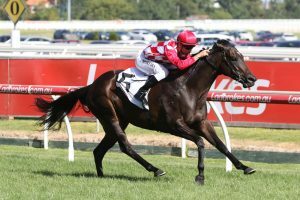 The eight year old Group 1 winner is one of five sprinters that has been nominated from the Ellerton and Zahra stable, and is joined by Booker, Crystal Dreamer, Rock ‘N’ Gold and Sword Of Light in making up the total of 23 Oakleigh Plate nominations. Booker was quick to regain her high quality 2017 Spring Carnival form with a first up win in the Group 3 $150,000 Kevin Hayes Stakes (1200m) at Caulfield on February 10 and the three year old filly is also nominated for the Group 2 $200,000 Ladbrokes Angus Armanasco Stakes (1400m) and the Group 1 $500,000 italktravel Futurity Stakes (1400m). Sheidel is one of three sprinters from Lindsay Park that are nominated for the Oakleigh Plate, the other two are last year’s Ladbrokes Blue Diamond Stakes winner Catchy and the four year old Star Witness mare Fuhryk. 2017 Golden Slipper winner She Will Reign is another high profile name among the Oakleigh Plate nominations as is Russian Revolution and three times T J Smith Stakes winner Chautauqua from the Team Hawkes stable. Chautauqua hasn’t filled a placing from four starts since winning 2017 Group 1 $2.5m Darley T J Smith Stakes (1200m) at Randwick but the grey flash can never be underestimated. Early betting for the Ladbrokes Oakleigh Plate at Ladbrokes.com.au has the Peter and Paul Snowden trained Russian Revolution as the $5 favourite just ahead of She Will Reign at $6m, Booker at $6.50 and Snitty Kitty and Chautauqua at $9. Early betting for the Ladbrokes Oakleigh Plate at Ladbrokes.com.au: $5 Russian Revolution, $6 She Will Reign, $6.50 6 Booker, $9 Snitty Kitty, Chautauqua, $11 Catchy, $15 Fuhryk, $17 Hellbent, Bons Away, Illustrious Lad, $21 Flamberge, Lady Esprit, $26 Crystal Dreamer, Savanna Amour, Glenall, Prussian Vixen, $34 Sheidel, $41 Malibu Style, $51 Palazzo Pubblico, Quilista, Rock ‘N’ Gold, Sword Of Light, $101 Olivier.